In America's Scorpio Rising natal horoscope, ably championed as our natal chart by Michael O'Reilly, the 8th house of Debt, Credit, Insurance, Legacies, Shared Resources of all sorts, Corporations, Star Chambers and Hidden Councils, Transformation, and Death will have a money-laden, ideology driven, politically savvy visitor until approximately mid-August 2013. As you see in the Scorpio Rising chart just below, The Jolly Giant is knocking at its cuspal door of 7 Gemini 42 as I type and performed a Direct Station on January 30, 2013 @6Gem19. The planet of generosity and investment has gone by many names but we know him as Jupiter. While in our national 8th house, Jupiter will visit the planets posited therein: Uranus 8Gem54, Mars 21Gem17, Venus 2Can57, and then, natal Jupiter @5Can54 which times our nation's (12-year) Jupiter Return. USA July 4, 1776 2:22 pm LMT Philadelphia, PA; Hour of Jupiter; chart-ruler Mars in 8th house with sub-ruler Pluto Rx in 3rd H; 4th H Moon of We the People in 4th H of Domestic Scene, Home, and now--since the Bush-Cheney regime--of the Germanic 'Homeland Security'. The Sun-Jupiter conjunction gives us a Jupiterian optimism and sense of expansion and adventure. And boundary issues. And American exceptionalism inflation. ASC 8Sco47 is conjoined by President Obama's natal Neptune at the same degree, and our natal Neptune @22Vir25 in 11th H veils the president's natal Mars, planet of war and weapons, and making his actions and motivations difficult if not impossible for We the People to know or completely understand. However, popularity, charisma, and glamor are constellated by Mars-Neptune however unstable its influence may turn out to be. Jupiter to Uranus = situations and opportunities broaden, training and travel are emphasized, and lifestyle choices, freedom, politics, and finances are areas which may see improvement. Jupiter to Mars = physical tasks and competitions go easier and are expected to succeed; good fortune through relationships with males may be evident but laziness will not suffice; expansion of US forces into Africa is already underway and may be increased; sequester cuts may be avoided for the US military (Mars) as resources for troops, weapons, and new battles are actually increased, not retracted (Jupiter.) Soon Jupiter also squares natal Neptune in Virgo, a confusing time of illusion and deception when we should avoid those promoting a "big picture." Jupiter to Venus = overindulgence, extravagance, and luxury are on the menu (along with caviar? yuck! ); some will see success with writing, publishing, the arts; avoid laziness and over-estimations, and don't take anything for granted since relationships may come along that promise more than can or will be delivered! As ruler of natal 7th H of Partnerships and the 12th H of Politics, Self-Undoing, and Karma, this may be a trickier time than usual for US diplomatic matters and for finances. But perhaps money for embassy security will be beefed up by Congress which previously had voted large cuts in recent years. Jupiter to Jupiter = US Jupiter Return which is supposed to be a time of rewards, confidence, and expansion; commerce should improve along with finances and the National Treasury (2nd H with Jupiter ruling) if negative forces--and people--do not interfere. And just on the other side of the 9th H cusp lies US natal Sun (leadership) @13Can12 so Jupiter's hit denotes some sort of culmination of something begun 12 years prior. This obviously goes back to the WTC attacks on 9/11/01 so unless much needed improvements and investments occurred while tr Jupiter conjoined our 8th H planets, we may find ourselves up against a tide of similar challenges once again especially with tr Pluto (here @10Cap39 and about to enter natal 3rd H of Communications) and tr Jupiter moving into opposition. 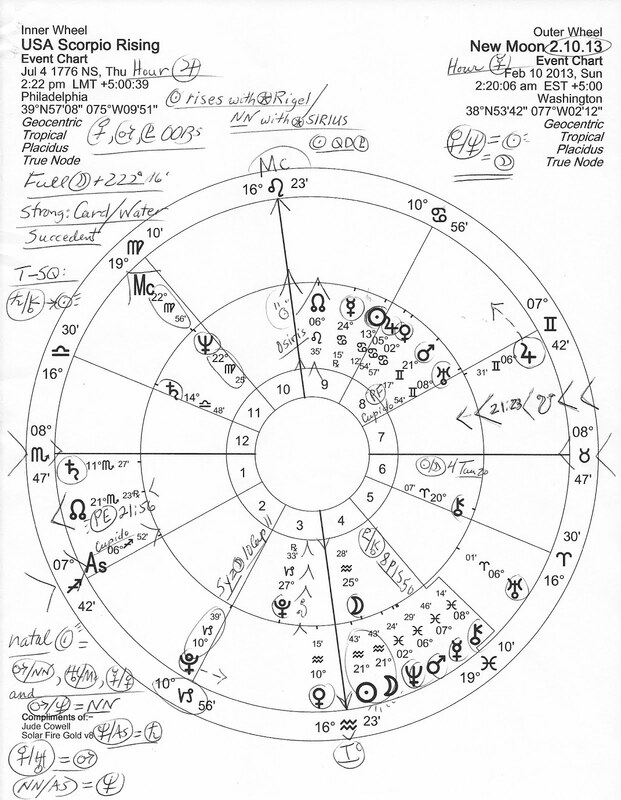 Their opposition relates to the 13-year cycle of Jupiter-Pluto conjunctions, the last one beginning on December 11, 2007 @28Sag24, day of a Fed meeting so we must look to the Federal Reserve Bank for clues concerning this transit with social values being questioned and plans for growth being challenged. Of course, 2007 was the year that structural abnormalities within our financial and housing markets began to be impossible to hide--and Wall Street criminals are still playing their casino games and risking further collapse of the US and global economies in 2013! Whether America's Jupiter Return on July 22, 2013 will be a successful reward cycle for the US economy depends greatly upon what the political varmints in Washington DC decide to do during the upcoming stalemates they will replay over the next few months. As you know, the Super Congress' (Super Committee) came to no good result in November 2011 other than to force a 'sequester' plan to perpetrate meat-cleaver cuts which, if enacted on March 1 (or ever), will decimate both the domestic and military budgets of the US. Some say that's what the secretive power elite intended all along--it's just that skittish Americans must be handled differently than Europeans. 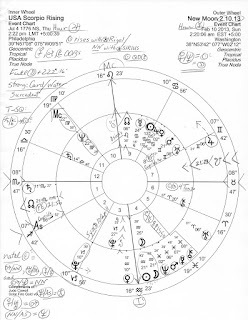 Now if you remember, the 'Super Congress Eclipse' (as I termed it) on November 25, 2011 @2Sag37 (in 1st house of our Scorpio Rising natal chart) has a 'peculiar turn of events' theme with 'unexpected happenings in finance' and it heralded 'an acute time of confusion in relationships' (Brady's Predictive Astrology.) This 14 North eclipse occurred a mere two days after the Super Congress' recommendations deadline (Nov 23) and is within the allowed two weeks for describing that moment and their sneaky actions only too well. So the best the congressional committee denizens could do in November 2011 (and since they take orders from unknown entities on such matters) was to set up the sequester to fester until 2013 when I suspect a way will be found by Congress to nix the majority of military budget cuts while, if they can, making harmful budget cuts that will collapse this nation through domestic spending for those who can ill afford to do worse financially than they already do. The suffering has been seen within European nations where austerity measures have been taken and austerity promoters may force them upon the American people after all--by way of automatic 'sequestration', it seems. Yet the dramatic last-minute 'fiscal cliff' deal postponed the sequestration implementation date from January to March 1st and here's how sequestration would work as our political thespians pretend that--sigh!--massive cuts seem very likely happen. Are they telling us they have no say in such matters? Then tell us what shadowy entity does, oh neutered Congress!